A popular summer soup with tomatoes and corn. Serve warm or chilled. 1. Heat butter in a large pot over medium flame. 2. Add the garlic, onions, celery, carrot and saute for 2 minutes or until the vegetables turn light brown. 3. Add the tomatoes, parsley, sugar, salt and pepper powder. 4. Pour the vegetable stock (or water) and stir well. 6. Reduce flame to low-medium and simmer for 20 to 30 minutes. 7. Switch off the flame and allow it to cool. 8. Gently blend the soup using a hand masher or blend in a mixer. 9. Strain the soup and discard any solids. 10. Transfer the soup back to the pot and place it over medium flame. 11. Bring to a boil and add the corn. 12. Gently simmer until corn is tender. 14. Garnish with basil leaves. Note: You can skip steps 8, 9, 10 if desired. Add the corn after step 7 and continue with step 12. 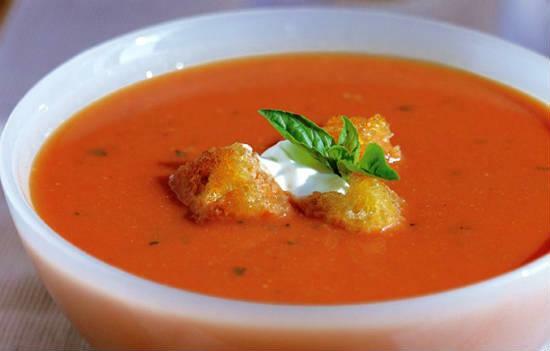 Feel free to comment or share your thoughts on this Tomato Corn Soup Recipe from Awesome Cuisine.